... Thomas Smith Jr. arrived at Newcastle on the Ards Peninsula, with 100 men and permission from Queen Elizabeth I to plant an English colony here. Later this year, on Saturday 1st October, I'll be leading a bus tour with Loughries Historical Society of the lower end of the Ards Peninsula (which, paradoxically is called the Upper Ards - some folk are prone to getting that historical distinction very badly mixed up), visiting some of the sites associated with the failed/forgotten Smith English colony, and of course with the later successful Hamilton & Montgomery Scottish settlement which began in May 1606. You can find out more about the Smith scheme in the booklet which I published last year with help from Mark Anderson and Loughries H.S..
• On the evening of Wed 14th September I'll also be giving an illustrated talk about the Smith colony to Ards Historical Society (at the old Town Hall / Ards Arts Centre in the Square) starting at 8pm. As far as I know entry is free and you'll get a cup of tea forbye. • Mark's blog, A Balmoral Perspective, is always a great insight into his work and interests, you can read it here. There may even be a few spaces left on the tour. • On Saturday 17 September, I'll be repeating the tour which Mark and I devised last year for Loughries H.S, which we called 'A Forenoon Aroon the Ards'. This time it's for Ards Borough Council, and some places are still available (contact the Ards Tourist Info Centre for details). 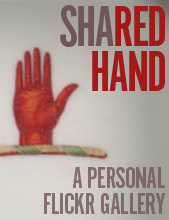 It runs from 10am - 3pm and has been advertised in the 'Experience Ards 2011' brochure. I really enjoy being out among local folk who share my interest in our local history. I always end up learning a lot from them, as well as enjoying their company. I have over the past while gathered up more old books, some of which are theology and church history from the early 1900s which were printed in Scotland. I will add a few of them here now and again which might be of interest to some readers. 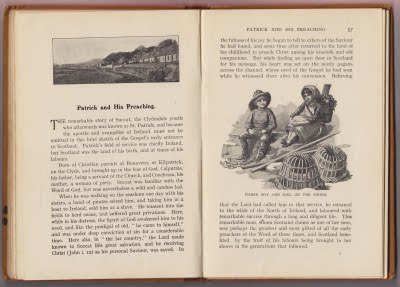 Below is a scan from 'In Scotia's Wilds - the Story of How the Gospel entered the land of the Thistle and wrought its wonders amongst the Ancient Dwellers there', published by the (Plymouth) Brethren publisher John Ritchie of Kilmarnock. (Ritchies still exist today, as Ritchie Christian Media. Their office is close to Dean Castle). 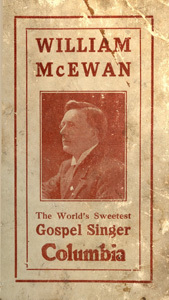 The book has a message written on the inside page which is dated 1921, so the book is at least as old as this. It's in short chapters, and gives an overview of pre-Christian history up to the times of Ninian, Columba and Iona, and so is not standard Brethren subject matter! 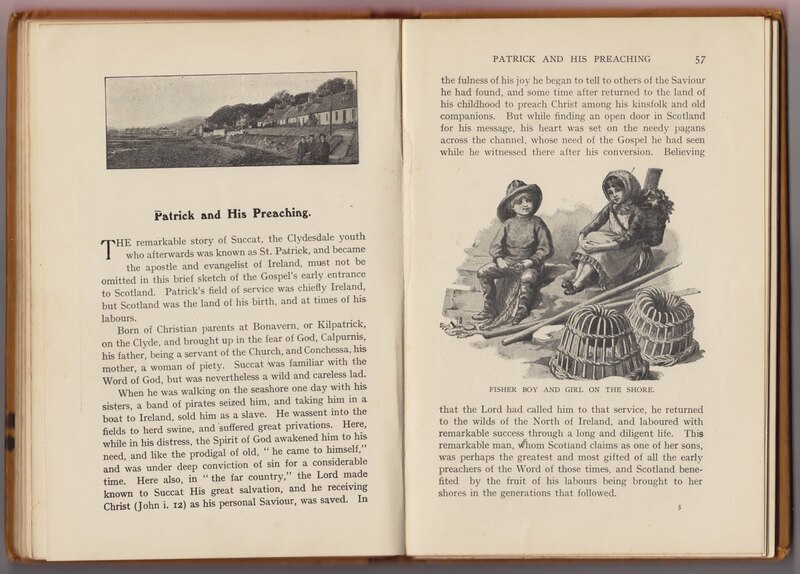 The chapter shown below - 'Patrick and His Preaching' - is yet another example of the Scottish traditions of (Saint) Patrick, traditions which have been almost airbrushed away on this side of the narrow sea. Click to enlarge. "there's no mony fowk bother their heids writin' ocht fur plain country workin men..."
A recent acquisition, and a real diamond in both rarity and quality. Whun a gied the furst book to Mister Allen he prented sae mony thoosan's that a thocht they wud niver a been sell't, but he tells me he niver did see ocht gaun aff the wae they did, an' there's har'ly a coppy noo left.... a jist write fur my freens aboot hame, an' if ony weel lerned buddy happens fur til see this, a hope they'll beer that in min'. They hae plenty till write gran books fur them, but there's no mony fowk bother their heids writin' ocht fur plain country workin men..."
"Here's a song about the inherent cuteness and tastiness of rabbits"
Very powerful post over at TheResurgence.com - click here. My two boys are getting bigger. They look like a pair of posers here but it was windy and they were cold - of course they had insisted an hour earlier that they should leave their coats in the car. Location information here - Black Mountain overlooks Belfast and is owned by the National Trust. The view is at the end of a 3 mile walk which is worth every step. Click pics to enlarge. A few weeks ago I received an email about this new book, written by Gordon Ramsey and published by Peter Lang. I've met Gordon quite a few times over the years at various musical events - not only does he study the bands scene, but he is also a member of a flute band as well. The best projects are always come from people who are within, who belong; mere book-learning by outsiders who are parachuted in is no way to treat folk culture. I'm sure that plenty of readers here will be interested in the book - find out more here. Following up on the post below about Colonel David Boyd and Dean Castle in Kilmarnock, another one of Sir Hugh Montgomery's closest associates was John M'Dowel (he died in 1611). The M'Dowel / McDowall / MacDowell family seat was at Garthland, near Lochans in the Mull of Galloway, which they could trace back as far as 1295 having been granted a charter by Robert the Bruce's rival John Balliol. There were other branches of the M'Dowall family nearby at Logan and Freuch. The family had a colourful history - for example the 'Ruthven Raid' plot in 1582 to kidnap young King James VI of Scotland involved Uchtred MacDowall (1526 - 1593) the 10th Laird of Garthland, but in 1584 MacDowall managed to get a royal pardon and secured a fresh charter for Garthland. Some sources say that he later came to Ulster and died over here. Unlike Dean Castle, nothing survives of Garthland Castle today, but in 1875 'Handbook for Travellers in Scotland' recorded in 'Route 10: Dumfries to Portpatrick' that the road to the Mull of Galloway passed by 'Garthland Tower, once the seat of the M'Doualls, Lords of Galloway' (source here). Its location is marked on Bacon's New Survey Map of South Scotland (pub. c. 1880), shown on the scanned detail above, tucked down in the bottom corner. Other references say what was once a 45 foot high tower had been demolished in 1840. Nowadays the tower is gone, but nearby is a farm called Garthland Mains which is said to include the old datestone of 1274 which had once been part of the castle. • The younger generation of Montgomerys and M'Dowels intermarried: Hugh's third son George Montgomery married John M'Dowel's daughter Grizel M'Dowel in 1633. The newlyweds settled at Ballylesson and also had land at Drumfad just south of Millisle on the Ards Peninsula. • A gravestone in Bangor Abbey graveyard bears the inscription 'Here lyeth ye body of Oughtred McConnell who lived in Bangor and died ye 11 of Sep 1702 aged 78 years.' Even though the spellings are different, this could well be another member of the same family. (click the photo below to enlarge). • '[around 1650] MacDowall of Garthland followed the popular preachers Rutherford, Livingstone and Maclellan...' (source: A History of Dumfries and Galloway by Sir Herbert Maxwell, 1900). Livingstone and Maclellan had of course been two of the Eagle Wing ministers. • in 1803 the M'Dowalls sold their estate at Garthland and relocated to Lochwinnoch in Renfrewshire and named their new estate as Garthland. And on and on it goes. 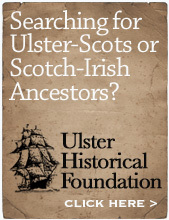 There is a mountain of detailed information available on these early Ulster-Scots. Usually the challenge is knowing when to stop digging. Dean Castle, in the middle of the Ayrshire town of Kilmarnock, is superb; we visited it on Saturday (on a day trip over the water to Glasgow to see Rangers playing Chelsea). This is where Sir Hugh Montgomery's close ally, Colonel David Boyd, was born (see previous biographical post here). The Boyds had been granted the land here by King Robert the Bruce in 1316 for their loyalty to him in his victory at Bannockburn. In the early 1500s, the Boyds and Montgomeries were rivals and enemies - the 4th Lord Boyd murdered two Montgomeries in 1523. It was the next Lord, Colonel David Boyd's father, who made peace with the Montgomeries and therefore laid the foundations for the two families' Ulster co-operation which began in 1606. Dean Castle is in a country park, with picnic areas, adventure playground, and entry is FREE! Definitely worth a stop-off for any Ulster folk who are getting the ferry, and are driving northwards through Ayrshire. Visit the website here. Man A: "Whit size d'ye think I'll hiddae get?" I was in Brighton a few weeks ago and an amazing shopfront stopped me dead in my tracks. All Saints Spitalfield was the shop, with an enormous front window completely filled with old sewing machines. The street was narrow, and the photo above was as much as I could fit into the camera. An amazing sight, and I thought it was an antique shop which had just acquired the contents of an old old clothes factory. (click to enlarge). I've since found that it is in fact a big clothes brand, with over 70 stores mainly in the UK but also in Europe and the USA. There's apparently one in Victoria Square in Belfast. I must admit I was disappointed to find that the window of sewing machines is part of the brand's corporate identity, rather than just a quirky one-off shop in Brighton. But hats off to Brinkworth, the design company who came up with the idea. > Have a look here for a mountain of photographs of the sewing machine displays on Google Images.